I first experienced this book on audio last year soon after it came out, and was kind of blown away. E. Lockhart wrote one of my all-time favorite young adult novels, The Disreputable History of Frankie Landau-Banks, so I was eager for her new offering and boy, it was a totally different kind of story. 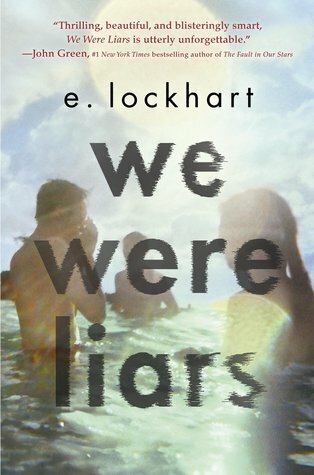 My Not-So-Young Adult Book Group at work chose We Were Liars for this month so I just read it again, in print this time. For a summary and my thoughts after listening to the audiobook, go here. This is a book filled with secrets that you learn only at the end, so re-reading it is truly a different experience. Fortunately, there's enough to love that the experience isn't diminished just because I actually know what is going on this time. One difficulty I had when listening to the audio is that I would sometimes be confused about which parts of the story took place in the present and which were in the fateful "summer fifteen." (Not because the book made it unclear, but because I am not a fantastic listener.) In print, I always knew which time period I was reading about, and I think this improved my experience. Because I knew all the secrets this time, throughout the book I looked for clues and was delighted every time I read something and thought "How did I not notice this before?" But they were subtle. You are a clever one, E. Lockhart. This time I was struck, even more, by the dysfunction in this family. They are wealthy and privileged and clearly want to preserve their family in very specific ways. Gat is an outsider not only because he's not related but because he's Indian. He is welcome in theory, but never really belongs. The family also obviously doesn't handle trauma well. After Cadence's Granny Tipper died, the family just erased her from conversation rather than acknowledge the loss. No wonder it's so difficult for Cady to figure out what happened to her two summers ago. Most people in my book group had read this for the first time. I got some early feedback from one person who thought the book was a bit too dark, but everyone seemed to really like it nonethless. This is a really great book for discussion. There is so much to talk about!